Click on the different sections on the image to view details about that section. Click Here to show ALL guides. Currently the auction software works best on a computer. The auction software works on phones and tablets, but not as well as on a computer, we are working to better optimize the application for phones and tablets. Video is in FLASH format and will require Flash is installed and enabled on your device for you to be able to view/listen to the live auction feed. You will receive a notice at the top of your browser regarding enabling Flash if it is disabled when you join a live auction. The Lot List is a display of all the lots available in this sale, on the left you will find the lot number, center the lot title, and on the right the lots status. The list automatically scroll to the active lot. The lots activate status is also defined by the color, grey is closed, sold, the current active lot is green, upcoming lots are white, and group / choice lots are high-lighted blue. If you have bid on and won a lot, you will see this bottom right of the lot you have won. Administrators can post global messages to all users in the channel. Direct messages between you and the administrators are private. 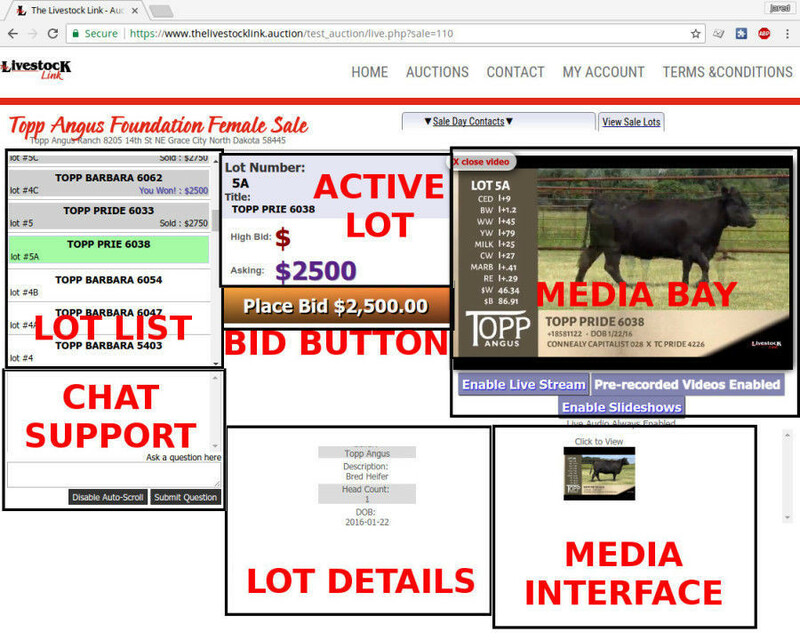 You can contact live auction administrators with your questions durring a sale. The active lot section displays the current high bid, and the current asking price. It will update between lots, as well as for each bid that is placed, both on the floor and by all other active bidders. The bid button can only be click when the sale is active / unpaused, your account is an authenticated bidder, and you do not already have a high bid. You can not outbid yourself. The price displayed in the button is the current asking price. If a special lot is up for sale, like a "Choice Lot" or a lot with multiple animals, selection inputs will display below the bid button. You can use the selection inputs to choose which lot of a "Choice Lot" or input how many head of a multiple animal lot you want to purchase. The winning bid is multiplied by your selection input. You will find Pedigree's, seller info, lot info, like breed, head count, age or Date of Birth here. Clicking on the Pedigree, will open it in the Media Bay for a better view. All media will be displayed here. The Live Stream is enabled by default. The live stream will play regardless of what media you have enabled, this way you can hear the live auction. If a lot has pre-recorded video(s) associated to it, you can click the Enable Pre-recorded Videos button to load this over top of the live stream. If a lot has images associated to it, you can click the Enable Slideshows to display the images in a slideshow over the top of the live stream. You can switch back and forth between the options, this will force the page to reload. All media loaded in the Media Bay over the top of the live stream will have a close button top left. All videos and images associated to a lot will be listed here. Clicking on one of the video or images will load it on top of the live video stream in the media bay.